Hei, oikein mukavaa sunnuntaipäivää! Tervetuloa elokuun Penny Black and More haasteen pariin. Britti b:llä alkavia juttuja etsitään, esim karhuja, perhosia, ruskeaa, mustaa... ja muista leimasin on pääosassa. Kurkkaa palkinnot tuolta blogista. Tein malliksi kaikkiaan neljä joulukorttia, kaksi tässä ja seuraavat 18. päivä! 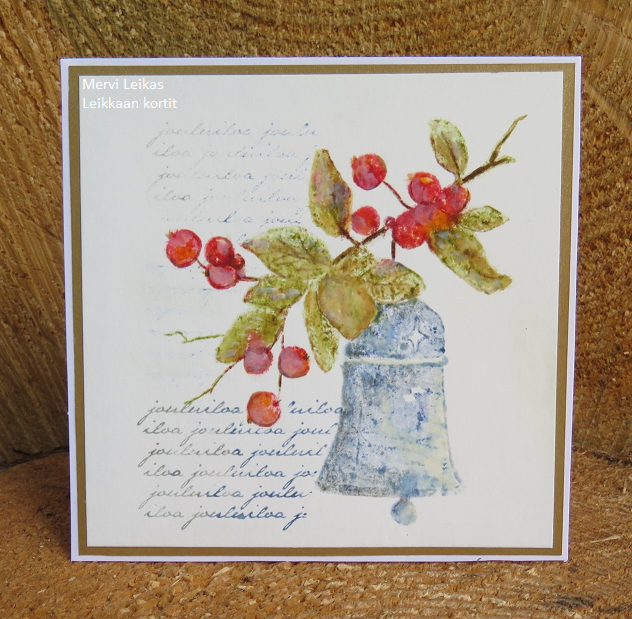 Hello, first Sunday of the month - it's time for new Penny Black and More August Challenge. "Something beginning with B" is the stamping theme. 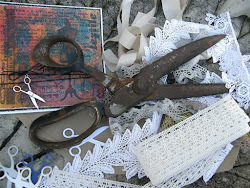 Our sponsors are Penny Black, Crafts U Love, Inkylicious Stamps. 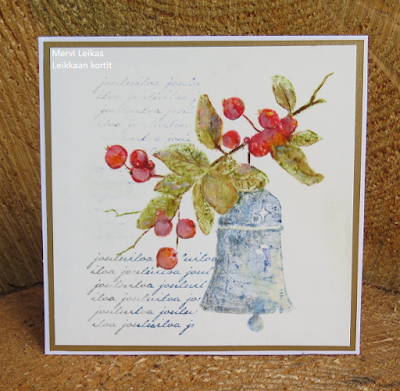 My DT card is a Christmas card with bell and berries and blue - ok I made four as I'm so late with my Christmas cards! Here's the first two and you can see the rest at the18th August with different look! using stamping platform; Distress Inks, waterspray, white paint - lots of colour layersand a finished with brush! It's a lovley seasonal image Mervi, one for my wish list I think as love both your cards and look forward tos eeing the others. I am not familiar with this PB stamp, but it's GORGEOUS! Such pretty cards and perfect for the theme! 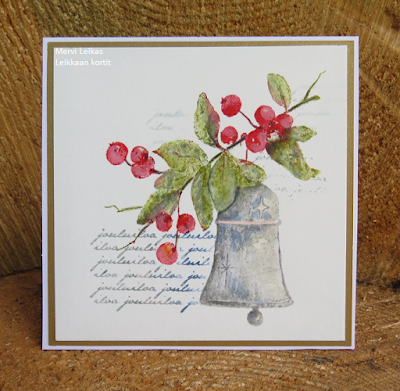 such beautiful christmas cards, mervi, i love the image and your colouring! 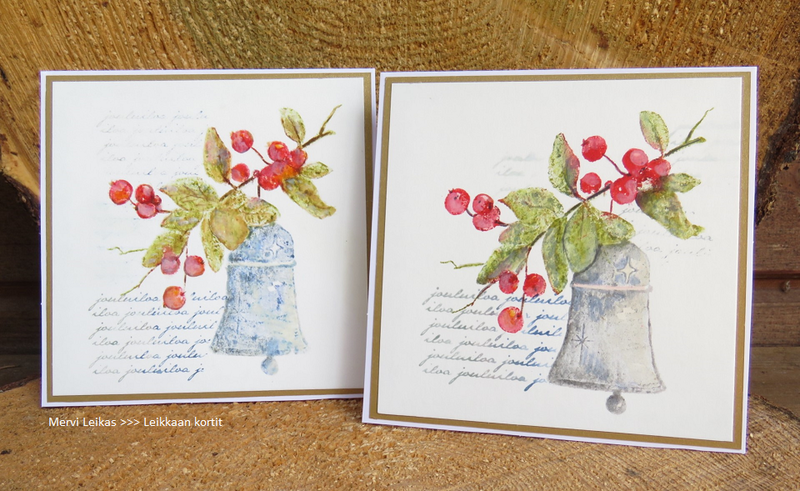 Two gorgeous cards Mervi, a great image and love the subtle colouring of the bells. 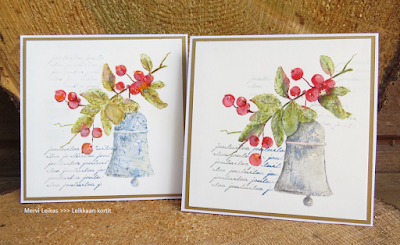 Two beautiful and elegant cards. They’re gorgeous, Mervi. I should start doing like you, making more cards of the same design with little twists, to avoid any last minute frantic Christmas card making.